Fire Island Pines Arts Project (FIPAP) presents the 2007 cultural and arts season in the Pines, punctuated by showcasing Whyte Hall, the Pine's new Community Center as well as diverse expressions of art, culinary and cultural programs. Glen Wielgus, President of FIPAP describes the season program as "one in which we've given the unique 2007 story of the Pines a lot of thought - the introduction of Whyte Hall, excitement around redevelopment of the harbor, diverse community spirit and an appreciation of all forms of talent, whether new to the scene or time-tested classics." Declares Tony La Rocco, longtime Pines resident and vice president, FIPAP: "I can already hear the applause!!! FIPAP sets the standards for exciting art and entertainment for the summer." Jim David is a headlining comedian around the world whose award winning career includes two MAC Awards for Outstanding Comedian and the BISTRO Award for Outstanding NY Comedian. TV appearances include ABC's The View, Comedy Central's Comedy Central Presents Jim David and numerous comedy club and Broadway shows. He currently splits his time between onshore venues and as resident comedian on Atlantis Cruises. Appearing with Jim are friends Bob Smith (The Tonight Show), Rick Crom (Urinetown), and Michele Balan (Last Comic Standing). Circus-like fun for kids and the young at heart. Music, games, face painting, food! DJ Twisted Dee spins. Special Appearance by the Pines' own Ron Perkov. Musical Theatre Phenomenon Barbara Cook entertains Pines residents and friends with the same silvery soprano and warm presence that has delighted audiences for over 50 years. Whether performing Stephen Sondheim, Jerome Kern or appearing at the Metropolitan Opera, Barbara Cook never fails to leave the audience with anything but adoration and a definite sense of being in the presence of one of the world's greatest singers - ever! "Beware the ides of March" but look forward to July 14th ! The Fire Island Shakespeare troupe will present "The Complete Works Of William Shakespeare (Abidged)" a 90 minute, fast paced comedy, and one of the longest running shows in the history of London's West End Theater district. A hilarious parody of all the plays written by Shakespeare rolled into one. "All the world's a stage" when performed outdoors with FREE open seating -- bring a beach chair, pillow or sit on the deck benches. We guarantee this is "Much ado about SOMETHING"! Although his credits include You're a Good Man, Charlie Brown, A Beautiful Mind and Six Degrees of Separation, Anthony Rapp is likely best known for creating the role of Mark Cohen in Jonathan Larson's landmark rock opera Rent. He now brings his new one-man show and his band Albinokid to the Pines. It is freely based on his recent best selling book "Without You: a Memoir of Love, Loss, and the Musical Rent," in which Anthony unveils his on and offstage experiences during the original run of Rent. This brand new show highlights his matchless talent, featuring music from the musicals "Rent" and "Hedwig, And The Angry Inch", as well as songs by REM, Radiohead, and original songs from Anthony's album "Look Around." Tickets $50 and will be on sale in the harbor. Enjoy an intimate cocktail and chat with noted and award winning producer, director and choreographer, Bob Avian. Bob Avian received Tony Awards for the original production of Chorus Line and Ballroom. He was also producer for the original Dreamgirls and choreographed the London and Broadway productions of Miss Saigon and Sunset Boulevard, receiving two more Tony nominations. Returning for the third time this season, Pines residents will host a series of five accomplished Chefs sharing their culinary skills in intimate private residences. Chefs included this season include Andre Almeida, Elisa and Richard Rosen, Richard Pittelli and Gino Chiapparelli, and Danielle Kucera. In conjunction with the culinary theme, FIPAP is also producing a cookbook of recipes submitted by the talented chefs of the Pines over the summer season. Cookbooks will be available in the Harbor. Our 11th Biennial Art Show will again showcase the works of local Fire Island Pinrs artists in the unique outdoor gallery setting at the homes of Ken Schwab and Peter Zinam; and Brett Baccus and Diane Freidman. All works will be offered for sale and FIPAP invites you to discover exceptional paintings, drawings, prints, photographs and sculpture - portion of the sale price is a donation to FIPAP. Admission is free to FIPAP members and sponsors, $5.00 all others. Complimentary refreshments. Fire Island Pines Arts Project, a 501(c)(3) tax-exempt organization, is the performing arts and cultural organization of the Pines. For generations, FIPAP has presented various plays, musical events, juried art shows, cooking classes and other cultural events to enrich and enhance the lives of the Pines Community and its residents. 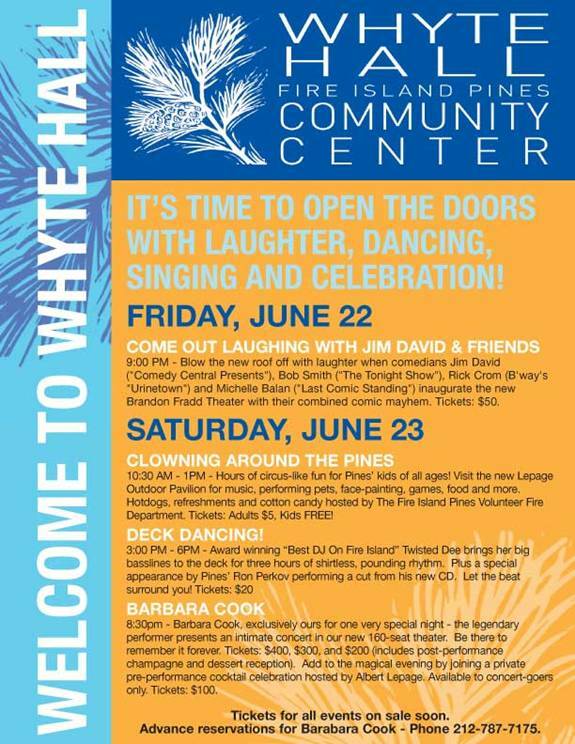 Tickets for all events are on sale in the Fire Island Pines harbor two weeks prior to the event. For more information, please contact the FIPAP President Glen Wielgus at 212-620-0519.